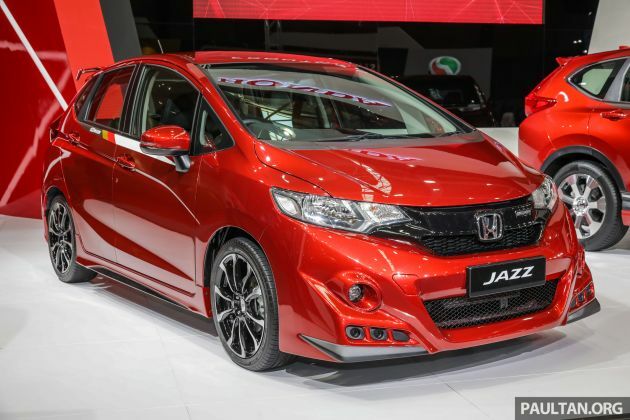 Honda Malaysia has brought the Jazz Mugen to this year’s Malaysia Autoshow following its introduction last month. The model on show is the concept seen at the 2018 Kuala Lumpur International Motor Show, as denoted by its Passion Red Pearl exterior shade. A limited 300-unit edition run of the Jazz Mugen has of course been launched, but that doesn’t come in red, with Modern Steel Metallic and White Orchid Pearl the only colours on offer, and these are priced at RM88,600 and RM88,720 (on-the-road without insurance) respectively. Design-wise, a Mugen bodykit finds its way on to the B-segment hatchback, and items include a front aero bumper with the distinctive three-hole cutouts, LED front fog lights, a sport front grille and tailgate garnish. Rolling stock are Mugen two-tone finish 17-inch wheels shod with 205/45R17 tyres. Though here it continues to omit the twin-tailpipe finishers from the 2017 Jazz Mugen prototype, the car features the window-line sticker strip, along with a contrasting finish for the front bumper corners. The rear bumper extension is the same as before, as is the mid-mounted tailgate spoiler extension. The Jazz Mugen is unchanged on the inside, bringing all the trimmings of the 1.5 V variant. Powertrain for the Jazz Mugen is carried over from the standard series model, where a 1.5 litre SOHC i-VTEC naturally aspirated four-cylinder produces 120 PS at 6,600 rpm and 145 Nm at 4,600 rpm, sent to the front wheels via a continuously variable transmission. Tak ada turbo?? Kalau ada, minimum 2.0 T Dan ke atas.. Tak perlu guns 1.5 tarik kerbau yang byak di jalanraya.. Better than overdone Ah Beng Yaris. That’s one ugly bodykit but not as ugly as Yaris one.